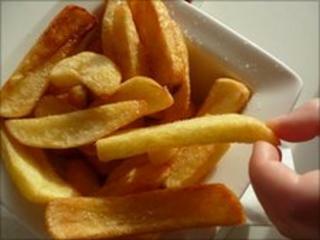 Unwanted chip fat is being used to power a passenger ferry in Cornwall. When the decision was taken to replace the ferry between Place and St Mawes on the Roseland Peninsula the engine of the new Cygnus boat was adapted to run on biodiesel. The waste fat which fuels the 10-minute sail journey is suppled by the St Mawes Hotel and the Idle Rocks Hotel. Owner Tim Light said other Cornwall Ferries boats could be converted if the trial is successful. "This will be a year-long trial and it's looking very promising so far," he said. "We'll have to see how it goes, but there's no reason the other ferries can't be adapted too." The chip fat is collected by Mr Light's brother when he delivers organic farm vegetables to the hotels and it is then taken back to the farm where it is converted into biodiesel. Mr Light said the performance of the ferry had not been adversely affected and the costs would be lower. "With fuel costs so high we're going to save money and if we can save money and in a small way reduce carbon emissions then so much the better," he said. It is hoped the idea could also attract more business. "We rather like the idea of passengers having their chips, then having their trips," Mr Light said. One thing currently being considered is adding rose petals or sandalwood to the biodiesel "to make it smell a bit better and bit less like chips", he added.